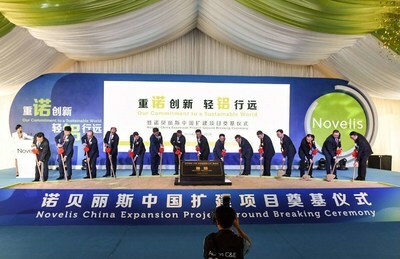 CHANGZHOU, China, Oct. 12, 2018 /PRNewswire/ -- Novelis (China) just held the groundbreaking ceremony for a new facility at Changzhou National Hi-Tech District. With the addition of US$72 million to the registered capital and a further investment of US$218 million, the facility is meant to expand production capacity of premium automobile aluminum sheets by 100,000 tons. Once construction of the facility is completed, Novelis' total investment to date in Changzhou National Hi-Tech District will exceed US$400 million. Changzhou city mayor Ding Chun was in attendance at the ceremony and gave a speech. Member of the standing Committee of the Changzhou Municipal CPC Committee and Changzhou High-Tech Park Party Work Committee secretary Zhou Bin, and district officials Chen Zhengchun, Wang Yuwei, Sheng Xiaodong, Xu Yawei also attended the event. The previous evening, they had met with a delegation led by Satish Pai, Managing Director of Novelis' parent India-based Hindalco Industries. Novelis (China), the Indian firm's first automotive aluminum sheet manufacturing facility in China, was established in Changzhou National Hi-Tech District in June 2012. It is also the country's first manufacturing base for premium automobile aluminum sheet. Novelis (China), a leader in automotive body and structural parts engineering in China, produces sheet that is mainly used in vehicle engine hoods, rear baffles, fenders, doors, roofs, chassis and structural parts. Current Novelis auto sheet customers include many international brands, among them, Audi, BMW, Ford, GM, Hyundai, Jaguar, Mercedes-Benz and Peugeot Citroen, as well as Chinese brands BAIC, BYD, Great Wall and SAIC. Production at the Novelis Changzhou facility for the year 2017 was valued at 1.273 billion yuan (approx. US$184 million). With increasing orders for electric vehicles from NIO, Audi, Cadillac and Jaguar, the Novelis Changzhou facility is on track to reach full production by the end of the year. With the date fast approaching, the company decided to build a new rolled aluminum production line and equip it with first-class equipment, doubling the annual output of aluminum sheet in Changzhou. On May 31, 2018, Novelis (China) signed a new project investment agreement with Changzhou National Hi-Tech District, and added US$72 million to its registered capital. Changzhou National Hi-tech District (CND) is located in the heart of the Yangtze River Delta. There are more than 1,600 foreign-invested companies in CND. Recently, CND is accelerating the development pace and intensifying the efforts on construction of an industrial base, making 2 pillar businesses: equipment manufacturing (precision machinery) and new materials bigger and stronger. The emerging industries consist of new generation of information technology, biomedical, new energy vehicle, photovoltaic and aviation.